In Mahabharat, King Janamejaya was great-grandson of Arjuna (3rd among Pandavas) and copper plate inscriptions dating back to 3012-3013 BC have been found about his donations to Hampi and Kedarnath temples. Both the inscriptions written in Sanskrit on copper plates are about the gift of land given by Emperor Janamejaya on the same day when the Solar eclipse was on. But the gifts were made at two different places, one at Kishkindha and another at Kedarnath. The year of kali and other details of the day were exactly the same in both the inscriptions. While one of them has been found by the Archeological Dept, the other was found by a devotee to Kedarnath who recorded the contents of the copper plate preserved in Kedarnath till today (more than 5000 years old). In the 89th year of of Jayabhyudaya Yudhisthira Saka, in the Plavangakhya (The year named after Plavanga ( monkey. Hanuman? ), In the Sahasya Masi, on the Amavasya Day (New Moon Day), on a Monday, Sri Janamejaya, ruler of the earth (king), born in the Gotra of Vaiagrani Vayaghra, enthroned in the city of Kishkinda, the protector of all Varnas and Asramas (classes and stages), in the western city of Sitapura, in the Vrukodara Kshetra ( Vrukodara is Bhima),for the worship of SitaRama who are worshipped by the honoured disciple Kaikaya of GarudaVahana (means Vishnu) Tirtha (water place) and others of the matha (mutt – mission) of the band of munis (saints), I give in the hands of the Yati (saint), along with Gold, the decree of the donation of land, of the area to the east of the Tungabhadra Jaladhara (called River Pampa by Valmiki), , in the presence of HariHara (Vishnu and Siva) in the time of aparaga (eclipse ? ), for the attainment of Vishnuloka by my forefathers, in the order of the four boundaries of the Muni brunda Kshetra, established by my great grandfather Yudhisthira (elder brother of Arjuna). 89 years, after Vyasa started writing the Mahabharata (originally named Jaya), Janamejaya, (Arjuna’s great grand son), made a gift of land to a saint, near the Tungabhadra. Janamejaya ruled in Kishkinda (Hampi). Janamejaya worshipped Sita, Rama and Hari (Vishnu) and Hara (Siva). Both the gifts were made by Janamejaya on Kali 89, in the year Plavanga, on a Monday, the New Moon day at the end of Chaitra. Kali 89 was the 29th year of the reign of Janamejaya. The chronology of events recorded by sages runs like this. Krishna left his mortal body 36 years after the Mahabharata war. Kaliyuga started at the moment of Krishna’s exit. That was the year 3102 BCE. 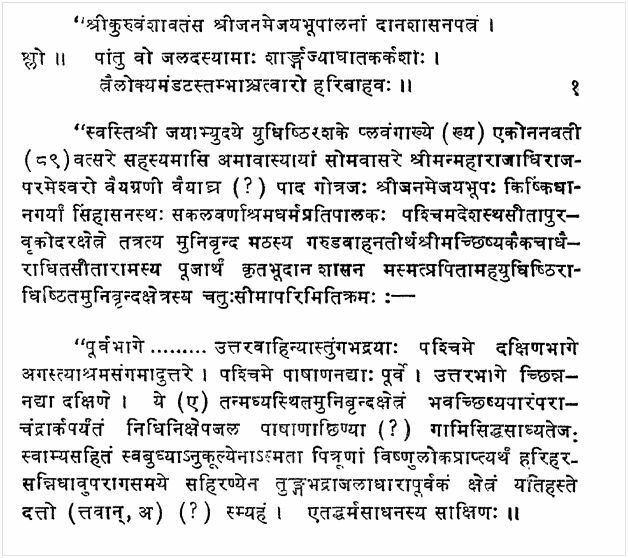 The year when Vyasa began writing the Mahabharatam titled ‘Jaya’ is called Jayabhyudaya Yudhisthira Sakam. That year is also year 1 of Kaliyuga. In Kali 1, Yudhishtra relinquished kingdom and Parikshit, the grand son of Arjuna and son of Abhimanyu was crowed. He ruled for 60 years. After his death due to snake bite, his son Janamejaya became the emperor. That was in 3041 BC. At Kali 89, he was in his 29th year of rule. The corresponding year at the time he made the gifts was 3013-3012 BC. The inscription recorded in the History of Antiquary is about the gift of land to Sitarama temple in Kishkindha. The king is described as seated on the imperial throne at the City of Kishkindha. (“Kishkindha nagaryaam simhaasanastha”) whereas the inscription on gift of land to the Usha Mutt at Kedarnath describes the king as being seated in the imperial throne at Indraprastha,the capital city of the Kurus. 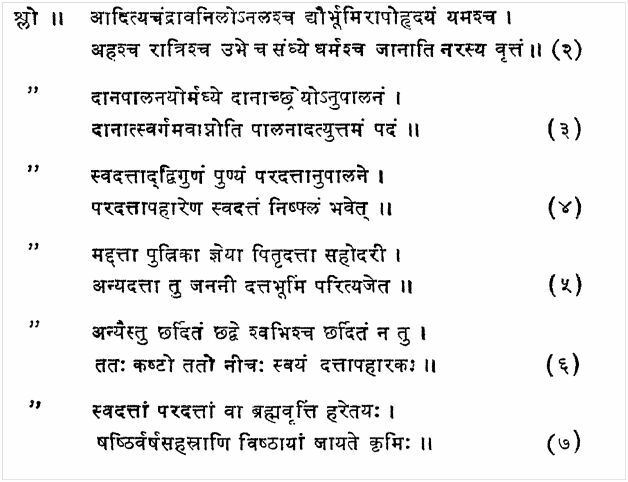 (“Indraprastha nagare simhasanastha”). 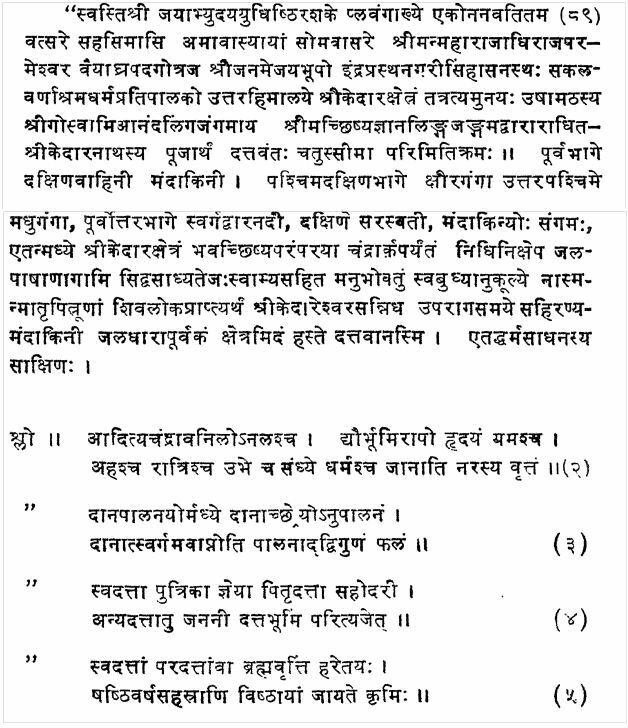 This difference in description need not raise doubts about the king mentioned because, in the inscription related to gift in Kishkindha, it is clearly said that the king is making the gift of land established in the name of his great grand father Yudhsihtra! It is customary to make gifts at the time of Solar eclipse as part of ancestral worship. The gift at Kedarnath was given for the worship of Kedarnath Swamy to Sri Goswamy Anandalinga Jangama Swamy of Usha Mutt through his disciple Sri Jnana Linga Jangama. This shows the disciple was received the gift document (Copper plate) in person from the King at Indraprastha. This copper plate is preserved till today in this Mutt. These 2 places have some historical significance. The Pandavas have been associated with Kedarnath on many occasions. They have often worshiped Shiva in Kedarnath and done penance. Arjuna got his Pasupatha astra after worshiping the lord here. There is a Usha Mutt here, perhaps related to Usha, wife of Aniruddha (Krishna’s grandson). Sitarama temple at Kishkinda (present day Hampi, Karnataka) mentioned in the inscription shows that it was the Pampa region where Rama met Sabari. 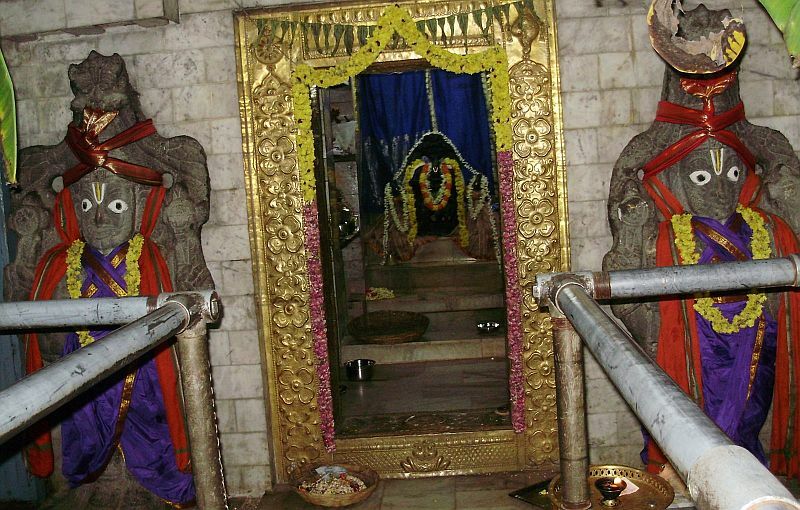 There is another proof that King Janamejaya toured Karnataka region (around Bengaluru) and this can be found at Venugopala Swamy temple which was first installed by Sapta Rishis, later reinstalled by Janamejaya, then Chola Raja and Kempe Gowda (founder of Bangalore City in early 16th century AD). Sila Sasanam (stone inscriptions) can be found on walls and slabs of temple even today. Kempegowda before building present Bangalore had its old place names as Benda kaaluru. He had renovated this temple and got Bleesings and then found and formed Benda kaaluru now it is Bangalore or Bengaluru. There is also a Hanuman temple at Adanur in Karnataka which believed to be installed by the king Janamejaya during his travel to this place.